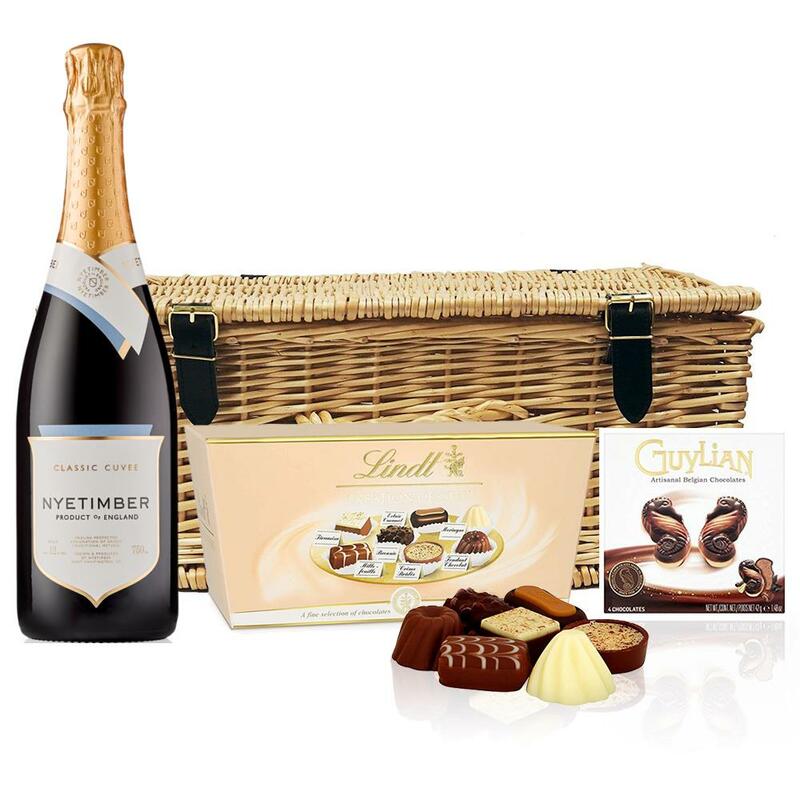 Nyetimber Classic Cuvee 75cl and Chocolates Hamper A delightful gift of Nyetimber Classic Cuvee 75cl along with a box of Guylian Artisanal Belgian Chocolate Hearts 42g and Belgid'Or Fine Belgin Choclates (175g) all packed in a wicker hamper with leather straps lined with wood wool. All gifts come with a gift card with a message of your choice. Nyetimber are located in West Sussex, and since their original plantings of classic varieties in 1988, have established themselves as Englands premier sparkling wine house, making world class wines to rival (and often beat in blind tastings) the big names of Champagne. Classic medium bodied English sparkling wine that is gentle and full of aroma. Gives champagne a run for its money with notes of honey, pastry and baked apple. A creamy and rich finish.????????ž???????????????????A??????A?? ?The ultimate home-grown alternative to Champagne, for all special occasions. This product is hand packed onsite by Bottled and Boxed, and is not affiliated with any other brand. Bottled and Boxed is responsible for this product combination/set.